- D 93288 : "The Empire-Builder from Calisota" (Lo$#11), from 1994, by Don Rosa. Nicholas, the eldest son of Alexander III, the Tsar of Russia, and Marie Feodorovna Dagmar, Princess of Denmark, was born at Krasnoye Selo, Pushkin, Russia, on May 6, 1868. Nicholas was educated by a tutor, Constantine Petrovich Pobedonostsev, who drummed the need for autocracy, the divine right of kings, the continued support of the Russian Orthodox Church, and the hatred of Jews into Nicholas, thoughts which unfortunately stayed with him all his life, and probably contributed to revolution. In 1893, he married the daughter of Grand Duke Ludwig of Hessen, Alix Victoria Eleanor Louisa Beatrice. When his father died, in 1894, Nicholas became Tsar (also spelt Tzar or Czar) Nicholas II. During his reign, Russia had to face two wars. In 1904-1905, the country suffered a heavy defeat by Japan : 400,000 men were killed, wounded or captured, and material losses were valued at 2.5-billion gold rubles. Even greater losses were suffered in World War I, which Russia entered on the Allied side on August 1, 1914, and during whitch took command of the army and left the government of Russia in the hands of his wife and her advisor Rasputin. He struggled desperately to hold on to power during both the 1905 and 1917 revolutions. Freedoms accorded to people in his manifesto of October 17, 1905, were soon annulled. Loss of territory, massive casualties and confusion at home, all this caused by wars, were the main reasons for the Second Russian Revolution in February 1917. 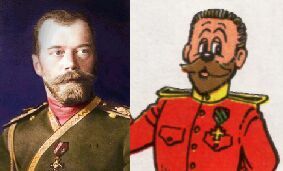 On March 2, 1917, Nicholas II abdicated and left the supreme power of the throne to his brother, Grand Duke Mikhail. In April 1918, the Bolshevik government decided to move the Imperial family to Yekaterinburg in the Urals. Here, he was executed on the night of July 17, 1918 along with his wife and children. The bodies were hidden and have only recently been found and identified. In Barks'"City of Golden Roofs", Scrooge evocates the time when he was selling concertinas to the Czar's cavaliers. In, "The Empire-Builder from Calisota" now rich Scrooge McDuck comes in Saint-Petersbourg, where he buys his famous hat and cane, and visits the Czar to buy him some Faberge's eggs. In his palace is a poster with written on it "Sales before Revolution. Everything has to disapperar". 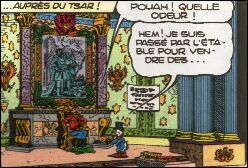 In this story, Don Rosa makes reference to Barks' story above, because the Tsar tells Scrooge that he's smelly, and Scrooge answers it's because he just passed by the stables to sell concertinas to his troops. Don Rosa makes reference to Barks' "City of Golden Roofs".